Other activities, any changes of schedule and general information will be posted on the Official Notice Board. The registration fee for this Regatta is $45.00 (USD)for Waves, 14’s and 17’s and $55.00 (USD) for 16’s, 18’s, Tigers, 20’s. Two shirts included for $55.00 entries, one shirt for $45.00 entries received by February 27, 2010. No regatta registration fee will be required for youth sailors under the age of 18. 2010 HCA membership is required to compete in this event. For advertising purposes, this regatta is a category C event (ISAF Appendix G). There will be a $20.00 late fee for registrations postmarked after 2/27/2010. You may pre-order extra shirts on your registration form for $15.00 each. Make checks payable to Midwinters West. Trophies will be based on pre-registration. Five or more pre-registered boats constitute a fleet, one trophy per five boats, and a maximum five trophies per fleet. This Regatta is hosted by Hobie Flota 469, & will be governed by the NOR for this event (except as altered by the Sailing Instructions), the 2009-2012 Racing Rules of Sailing and the class rules of the IHCA. 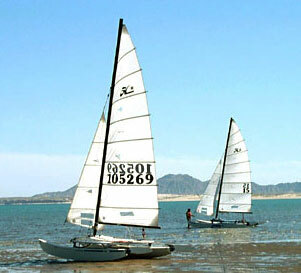 Sailing Instructions will be available at on-site regatta registration. 2010 HCA Membership and Comp Tips are mandatory. Bring cat wheels as every effort will be made to run as many races as possible, regardless of tides.